Hi there, This week I have been working on a few ideas and projects. First I made up sample “goodie bags” as a test for a future “goodie bag club” in my shop. 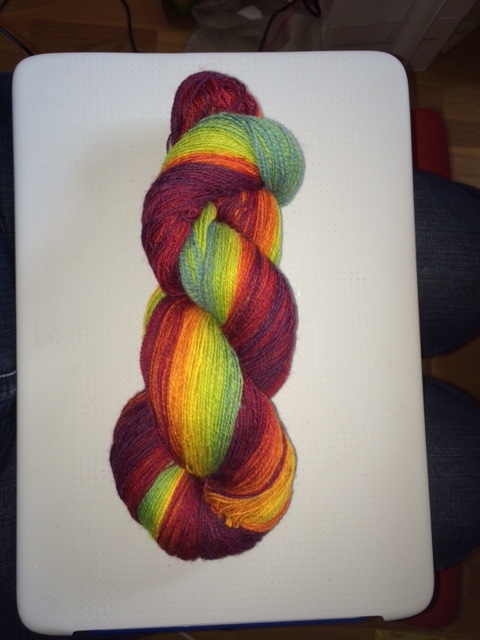 I’m thinking this would be a fun alternative to the classic yarn club. The idea would be to sign up and get a goodie bag every month or two. I’m thinking of something around 10€ and the test bags I made up include: 2 mini skeins (25m each – hand dyed sock yarn), 1 envelope of Soak (mini soak for washing your hand knits and try out before maybe committing to a whole bottle), some handmade stitch markers (we never have enough of those), a handmade needle stopper (same thing as with the stitch markers, we can always add a cute needle stopper to our project bag) and a pattern tamer from Atomic Knitting. This is a rough idea, I might change before committing to this. 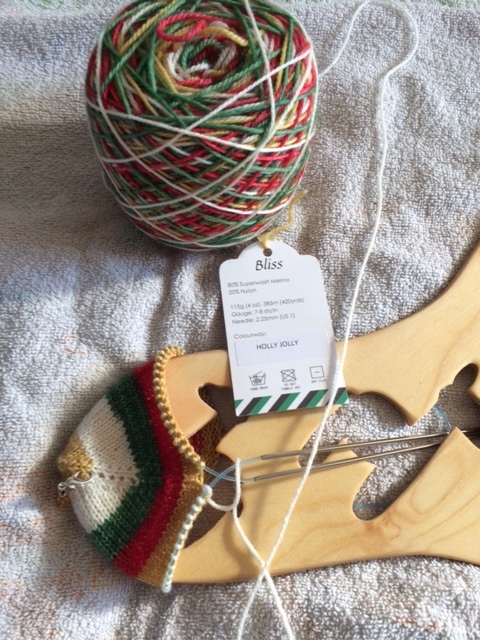 Of course each month the goodie bag would be different although there would always be 1-2 mini skeins (could be hand dyed or hand spun), a set of hand-made stitch markers and a knitting needle stopper . The rest of the items would change, there might be a needle gage or a cable needle or a stitch holder or some beads etc. You get the picture. 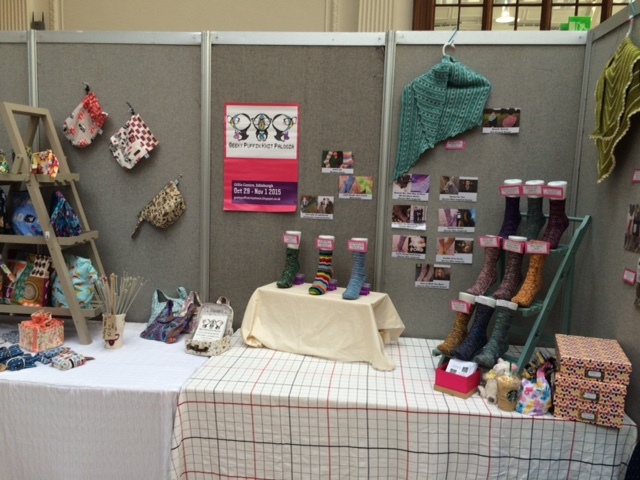 Something yummie, something handmade, always fun and at a reasonable price. 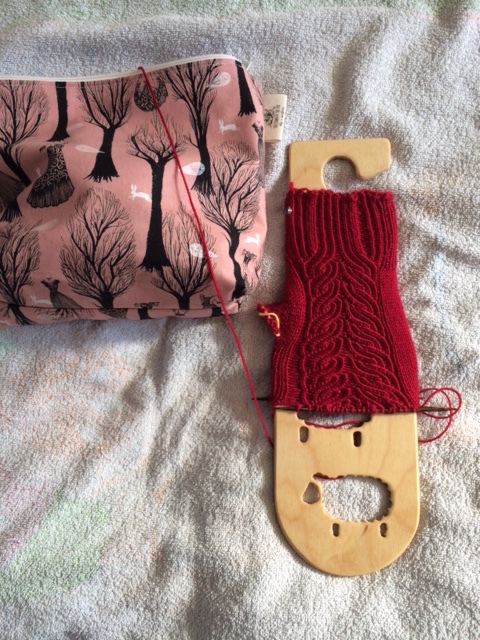 I’m also proud to announce that I’m participating, in a small capacity, (but participating nonetheless) in a knitting retreat that will be held in Edinburgh this autumn. 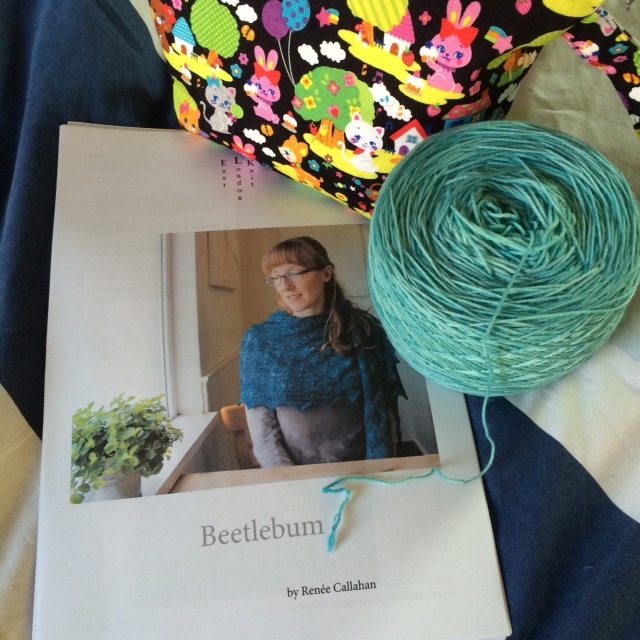 The retreat is called GEEKY PUFFIN KNIT PALOOZA which is being held for the very first time. The retreat is organised by CC Almond of JavaPurls and her daughter Demeris (they also do a podcast together that I highly recommend you check out: Geeky girls knit) and their friend Sam Bogia of KnitRunDig – you can find Sam’s shop here and her blog by clicking on her name (KnitRunDig). Sam has a project bag shop on Etsy and she also has a podcast you should check out by clicking through on the links above. 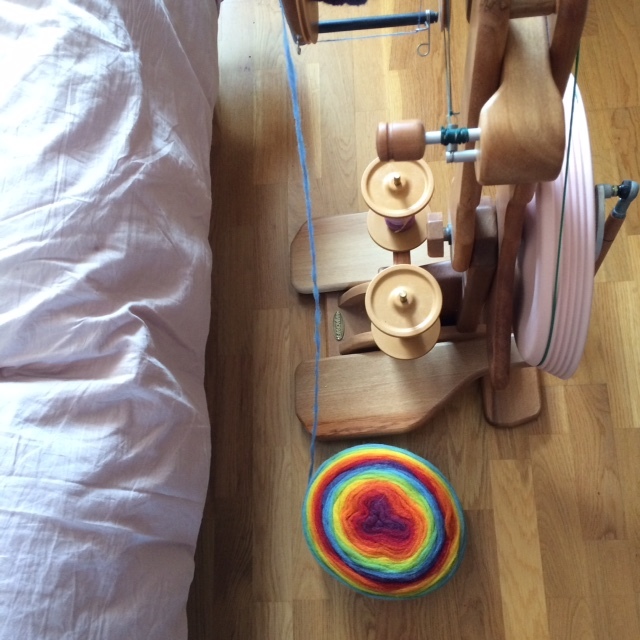 Now on the subject of spinning. It’s been a while since I shared my spinning with you. I think I told you a while back that I bought a bump of Kauni pencil roving in their Rainbow colorway and that I wanted to try to spin that up. I love Kauni effect yarn and I wanted to see if I could make some. This is also the first time I ever spin from pencil roving and it was quite fun. Now I have not only spun the pencil roving but plied it as well. I did a two ply and I have a gazillion meters I think. 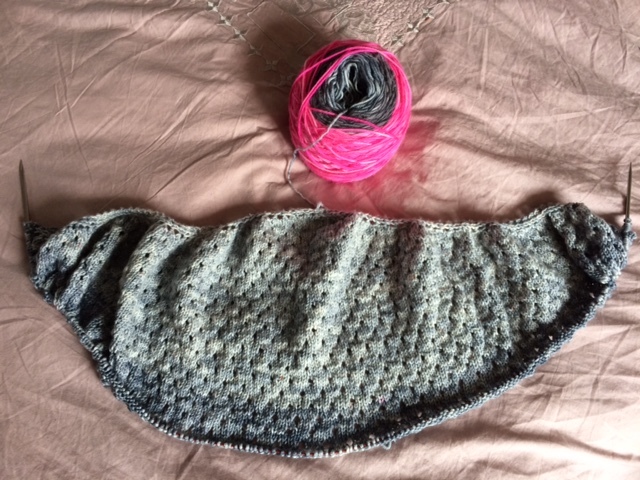 I have yet to wash and finish the yarn so I haven’t measured it out yet. 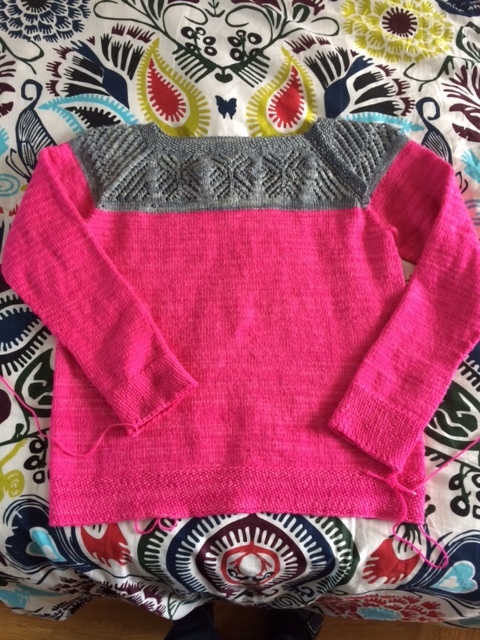 I love the outcome, as all Kauni yarns, it’s not soft but I’m going to wash it with a little hair conditioner and hopefully that will soften it a bit. I’m thinking I’ll make socks and mittens with this. Here you see the pencil roving next to my wheel. You can appreciate the gorgeous colors and how fine the pencil roving is. 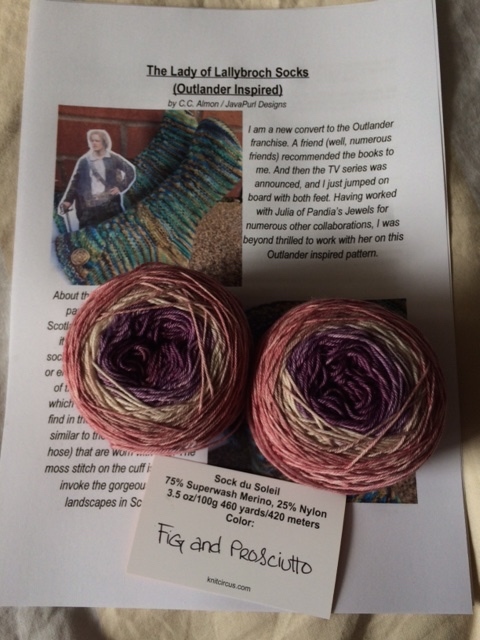 And here is my skein of handspun Kauni yarn. Personally I love it!!! 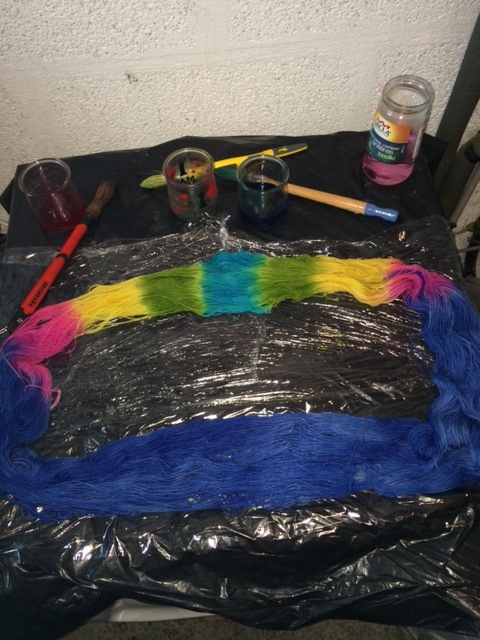 Last weekend I also did a little bit of test dyeing. I dyed 2 skeins of sock yarn using a fun technique I secretly call “candy dyeing” because I think it is such a fun way to dye and that the resulting yarn is almost as yummie as candy (yes I have a sweet tooth). So I did 2 skeins, using different main color for each and then using the same accent colors but organising the differently on each yarn. The yarn is still drying so I’m not able to show you what it looks like once reskeined yet but here are some in progress pictures. So you see, about 3/4 of the skein is dyed in one color and then approx 1/4 is dyed in small sections with accent colors. Here I have wound the hanks into skeins but the yarn was still humid so the skeins don’t look as yummie as they could be. They will be all dry and ready for reskeining pretty soon and I’ll be able to share with you those pictures so you can see the final result. 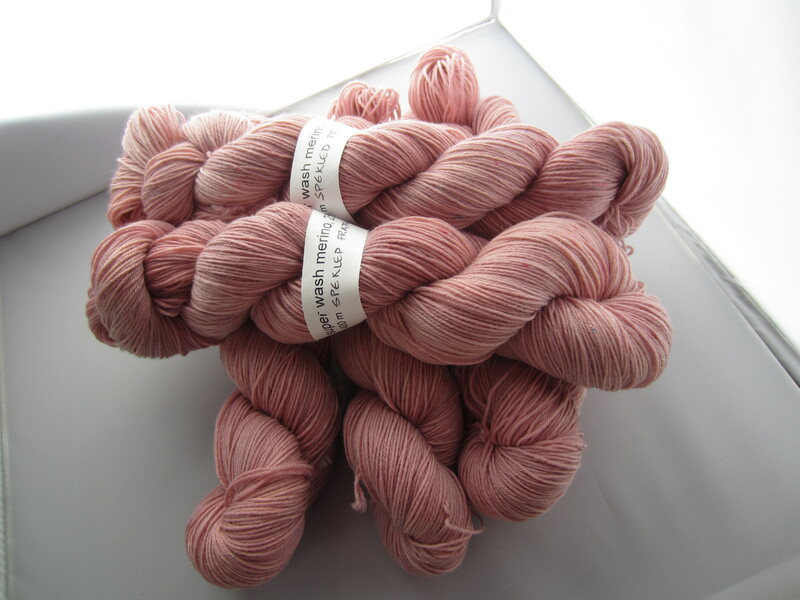 I’ve also decided that I’m going to use one of these skeins as my travel sock yarn and I’m currently looking for a good and simple sock pattern that will show off the colorway. 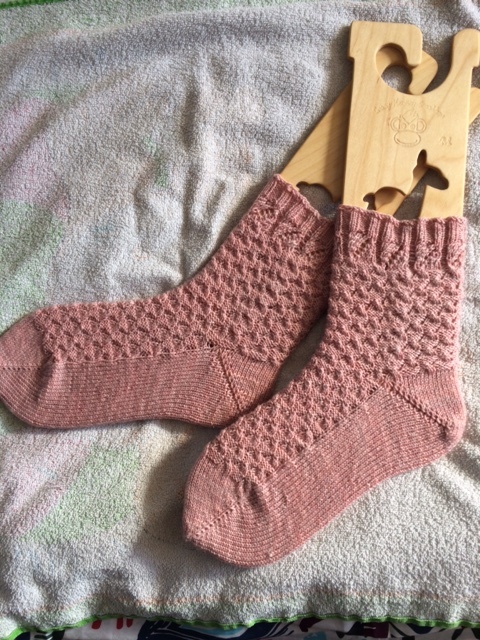 I don’t want cables or lace as I see these yarns as being something fun for simple vanilla type socks. That’s all for today. I’m thinking it’s almost time to do a little giveaway! I have finally reached the milestone of 100 subscribers to my blog and I’d like to celebrate by doing a giveaway. 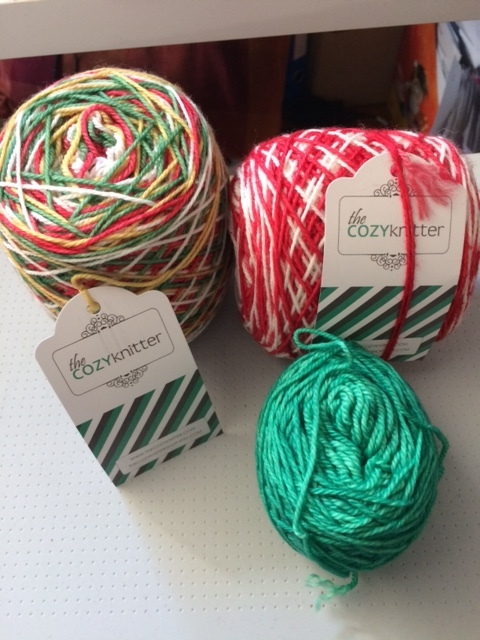 I’m thinking something super nice like a skein of sock yarn with a set of markers and a needle holder. Maybe one main price and 2 small ones… I’m going to sleep on this and think about how, when and what and I’ll be launching this beginning of October I think as I don’t have the time now before going to the US so once I’m back it should be fine. So stay tuned and join the fun. Thank you for taking the time to share my thoughts and wips I know you are super busy so I’m honored you allow me to take up some of your precious time. Hi there, I hope you are all doing well. First off, if you got a notification yesterday that a new post had been published and then went to the blog to discover there was none, my apologies. Yesterday I decided that I need to stop procrastinating and that I need to push myself harder and get moving on my project of opening up my own ecommerce website. I decided to try Shopify again and yesterday I posted a test post where I intended to include a product for sale. The item was supposed to show up in my blog post with a “buy” button and all the relative information but after reading the instructions over and over again I still failed to understand how to do this correctly. So the post I published had a picture but no link to actually buy the product so I ended up taking the post off the blog. I have to study this thing more closely. Opening up a second shop is soooooo time consuming! I have a ton of yarn and stitch markers to put online but it takes a lot of time to photograph everything and then set up online and I’m having a hard time finding the time to do so and also, I admit, I’m feeling a bit under excited – if that is understandable. What I mean is that summer time is typically a slow time for any yarn/fibre related business as the hot weather means that many prefer to not knit/crochet/spin and take time out and this inevitably means less sales. I know this is a fact and that my shop is not the only one to slow down but…..when trying to run a small business the slow times can be difficult to live. But hey, I’ve set myself the objective of either MAKING IT or CLOSING DOWN by the end of this year so if I really want this to work out for me I better stop wallowing and procrastinating and GET MOVING! 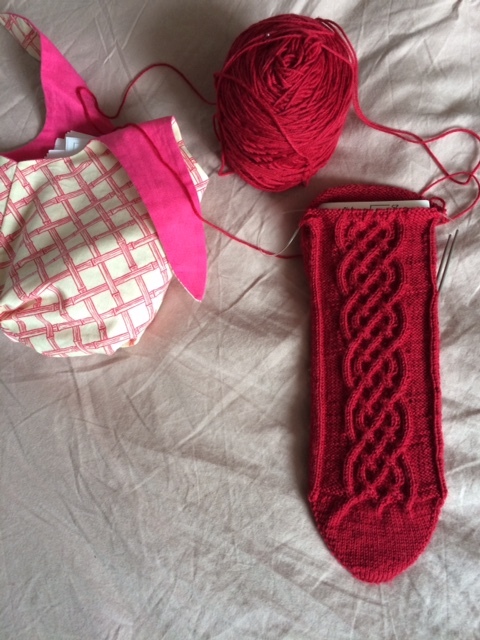 So I’ve been doing some knitting and here are some progress pictures. 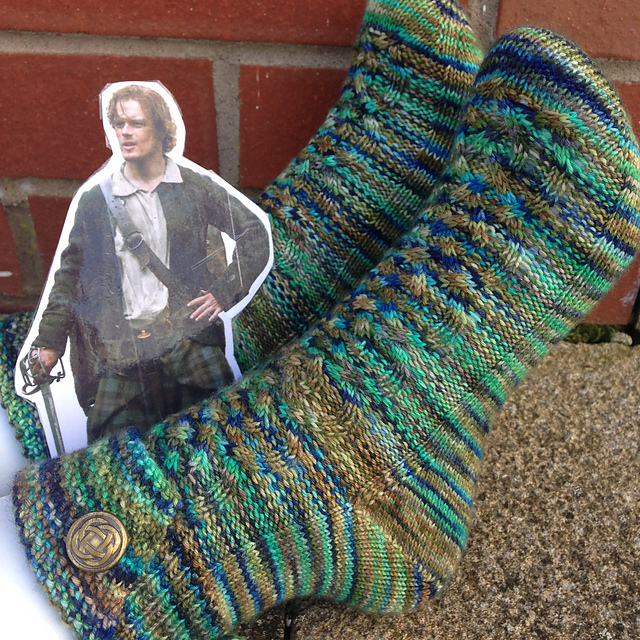 This is my Lady of Lallibroch sock by CC Almond also known as JavaPurl. 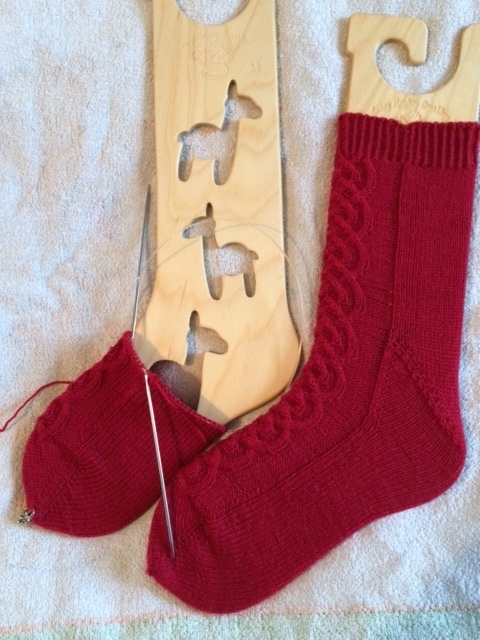 This is the first sock and I’m using Cascade Heritage yarn. 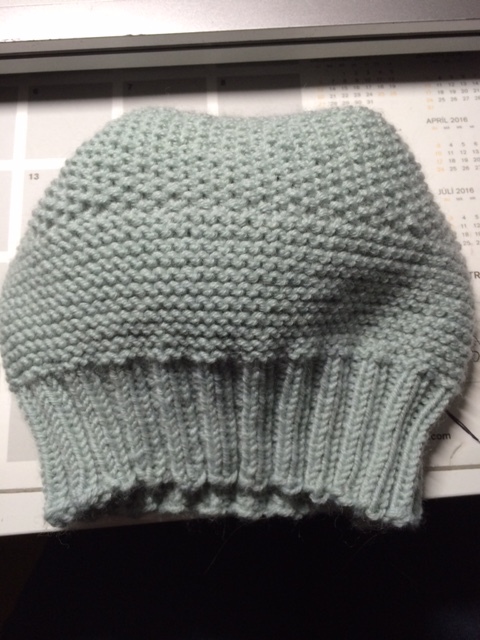 I really feel that the solid color yarn does the pattern justice. A varigated yarn would have taken the attention from the cable or at least made it less spectacular, I feel, so I’m really happy with my choice of yarn. This is an easy pattern also. The cable is a 16 row repeat and it really flows easily. So I’m coming along quite nicely. 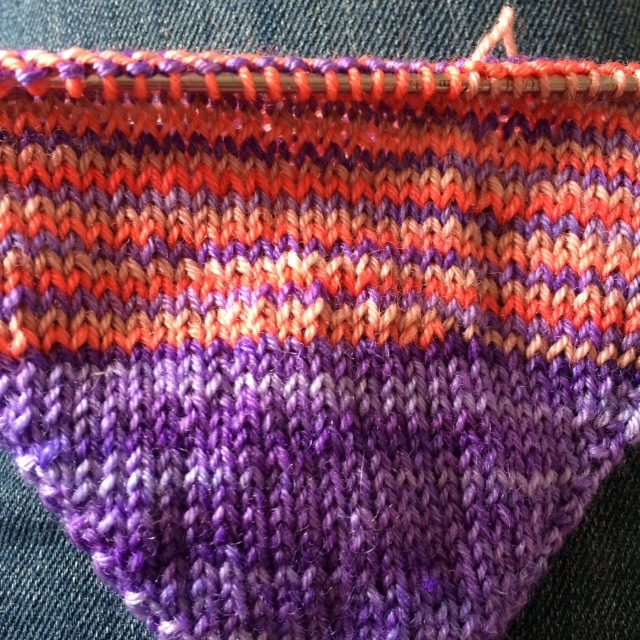 This is not a “knit at work” pattern but I do knit in front of the tv. 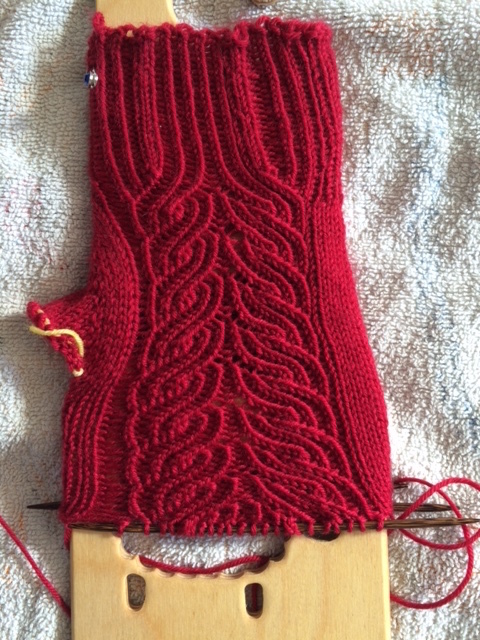 And then I decided to give the “Helix” color knitting method a try. I told you about this in my last post I believe. 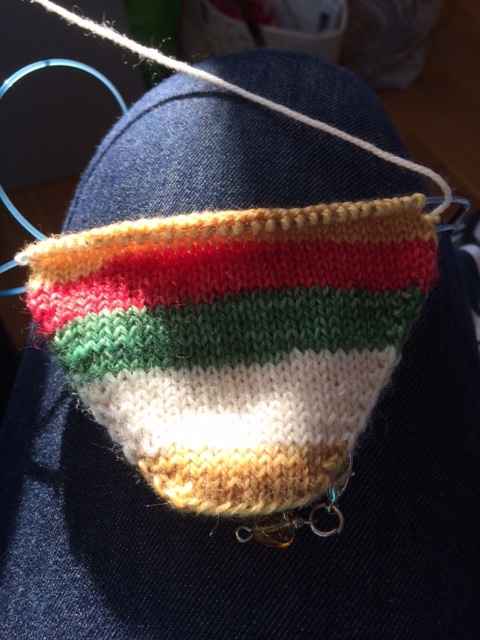 This prevents the infamous “jog” when knitting stripes. 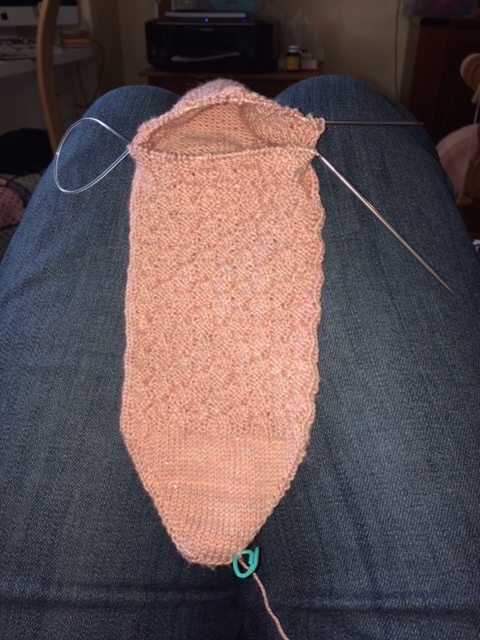 I’m knitting a sock from top down and this will either be a tube sock or an afterthought heel sock for my daughter. So far so good. 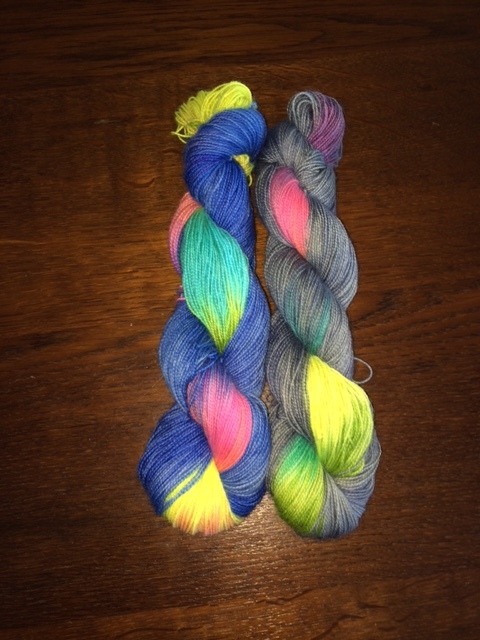 I’m using some of my hand dyed mini skeins. When I’m further along I’ll show you better pictures of front and back so you can see that the stripes flow without any jogs. And before I say goodbye for today, let me show you a picture that I’m pretty sure will have you drooling. I had another happy mail day this week! I recently placed an order online in a Germany online shop that I found when browsing the internet. 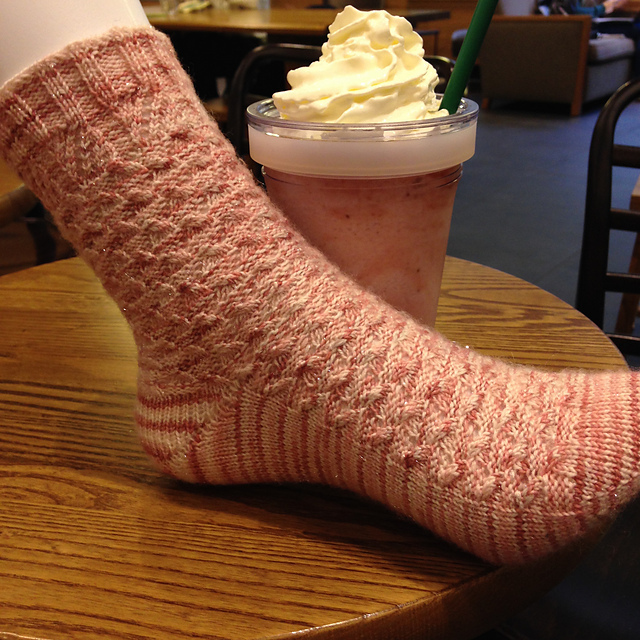 They carry Lornas laces yarns and it’s been a while since I knit with any of her yarns so I went…a little … crazy! Yebb! I bought 6 skeins!! 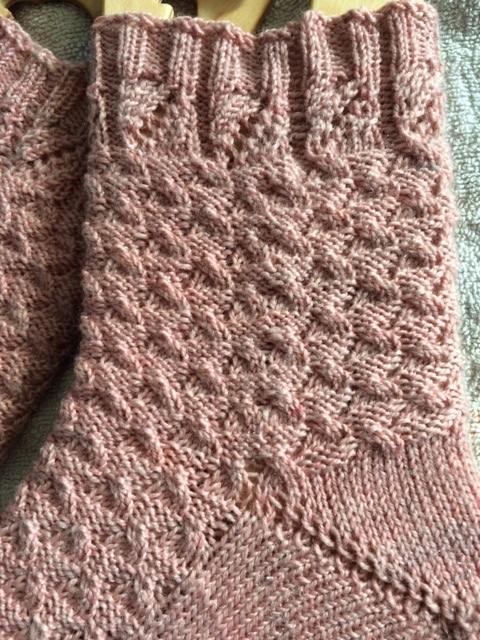 Of Lorna’s Laces Shepherd Sock yarn! I love it! 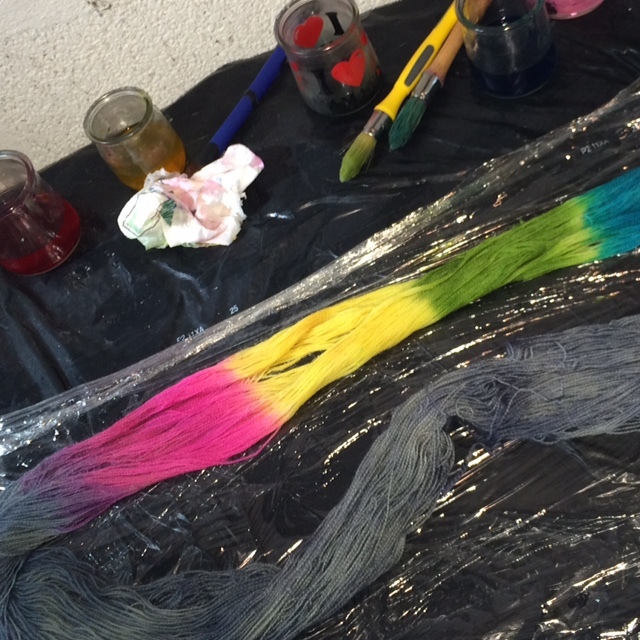 They dye beautiful yarns. So now I have this beautiful addition to my stash and a head full of sock patterns I can use these for. I’ll share some of the ideas with you later this week. 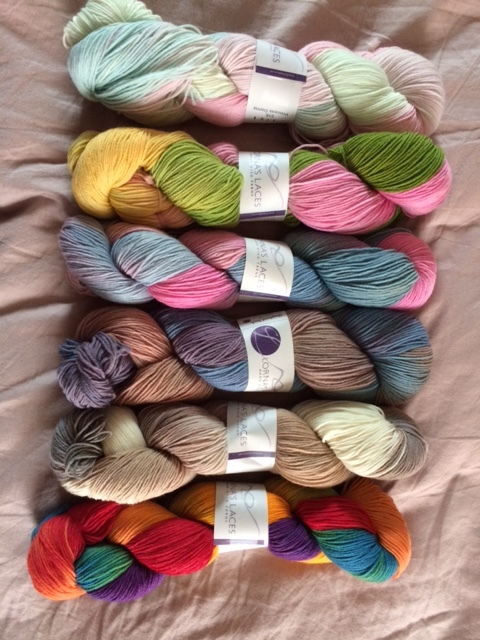 I really should not be buying yarn online when I already have a healthy stash in addition to all my own hand dyed yarns but…. But then again, looking at what others are doing is inspirational and informative so really this is a job related purchase to better myself and improve possibly my yarn dyeing etc. 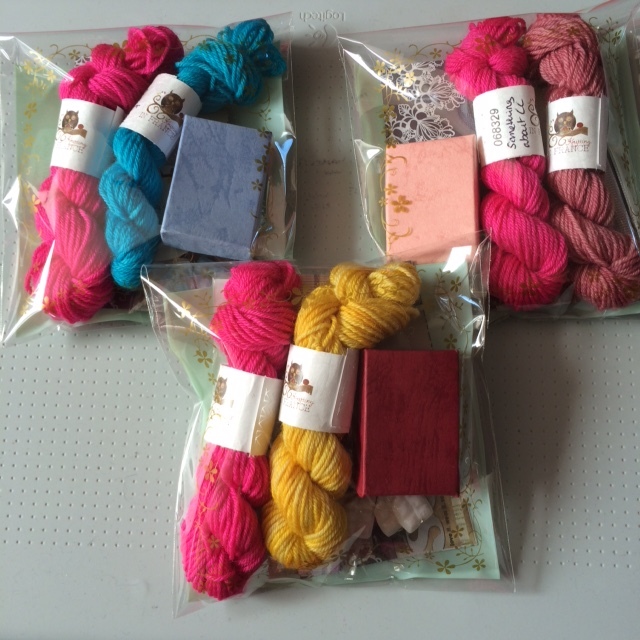 Hm, yes I think that’s it, no need to feel guilty about buying 6 skeins of this gorgeous (not cheap) yarn! I needed this for my business! Well that’s all for now. I hope you are enjoying your summer and finding time to do some crafting in spite of the warm weather. Thank you for coming by to follow up on my thoughts and works.